A combination of colorful Swarovski Pearls & a touch of Swarovski Crystal, hand wrapped in silver then linked together along with silver circle textured hoops, make this gorgeous design. 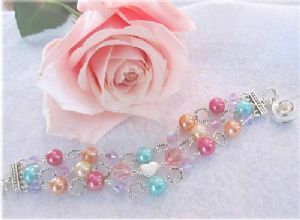 Three strands of pretty with the center strand to include, as shown...a Sterling Silver Heart focal bead. We finished with Tibetan Silver stress bars & a beautiful Swarovski Crystal Box Clasp. This design will arrive in a soft pouch for safe keeping and/or immediate gift giving. WOULD YOU LIKE TO ADD SHIPPING INSURANCE?